We can almost hear the jingle bells ring in Dubai, as Christmas is now less than 40 days away. Yay! And for the expats who won’t get the chance to fly back home for the holidays, how about you worry less about cooking this year, as we gathered a list of the best deals on Christmas food from Cobone to enjoy this year. Roasted Christmas turkey forAED 299. weighs 6.5-7 Kg, which is good for nigh on 10 people, it comes placed on a tray with stuffing seasonal vegetables, roast potato, cherry tomato confit and natural gravy, and with vegetables and potatoes on the side. Christmas hamper for AED 125. Includes: Christmas plum cake (500 grams), traditional German stollen bread (530 grams), homemade Christmas cookies (80 grams), dundee cake (120 grams), mince pie (80 grams), panettone bread (120 grams), and a chocolate box (9 pieces). Offer is valid from 1st December 2017 - 06 January 2018, and orders can be picked up daily from 09:00 am to 08:00 pm. Get your Cobone Voucher here. 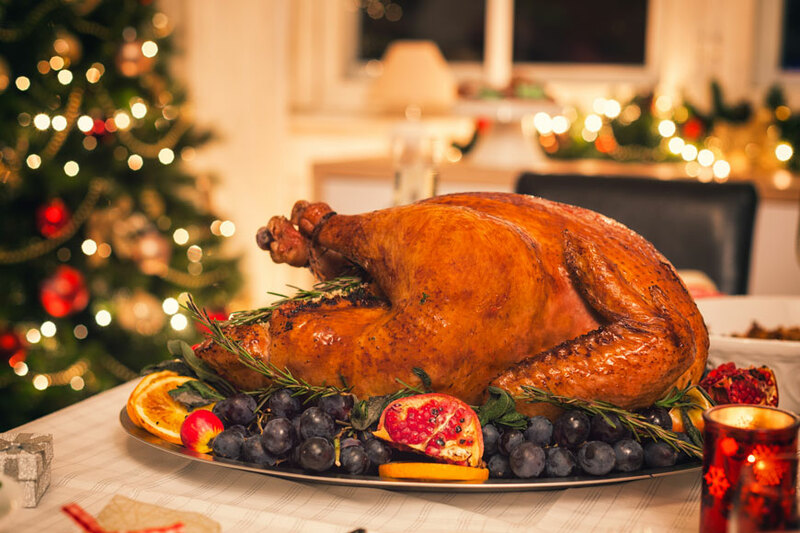 Enjoy Christmas classic meal of roasted turkey from Chelsea Plaza hotel without having to dine-in. All you need to do is dial up, and pick up your feast the next day! The offer includes: A Christmas roasted turkey. Weighs 5-7 kg, serves almost 12 people. And includes glazed carrots, broccoli, sprouts, roast potatoes, cranberry sauce, natural gravy, and of course the traditional stuffing. All for AED 249. Offer is valid from 7th December 2017 – 1st January 2018, and orders must be made at least 48 hours in advance. You can pick up between 9:00 am – 12:00 am. Get your Cobone Voucher here. If you already have your main courses sorted, check out the dessert option from Mövenpick Hotel and Apartments, as they’re offering a one kilogram cake for AED 99, Prepared with a traditional recipe enriched with fruit and nuts, and then matured for three months with "a secret potion." You can pick up the cake 10 December 2017 to 20 December 2017, after you have booked at least 72 hours in advance. Get your Cobone Voucher here.Get your Cobone Voucher here.